Situational awareness: Rudy Giuliani claims to the NYT that Robert Mueller plans to wrap up his Trump obstruction investigation by Sept. 1. WaPo's Bob Costa adds: "spoke w/ Giuliani a few mins ago... the Sept. 1 date mentioned by Mueller had a caveat. He said Mueller described it as the likely conclusion *only* if POTUS sat for an interview." Between the lines: We hardly need to say it, but that's one heck of an "if." A group of about 20 moderate Republicans are threatening to help Democrats force a vote on a DACA bill. If this works, it could trigger a larger rebellion — likely driven by the Freedom Caucus — similar to the revolt that brought down Ryan's predecessor John Boehner. On Friday, House Republicans failed to pass the farm bill — one of Congress's few remaining must-pass projects. Ryan, a lame duck Speaker, has little power over his members. He can't convincingly threaten them. And nor can he cajole them or make any promises to help members in the future. He's stuck. The ultra conservative House Freedom Caucus took down the farm bill, with chairman Mark Meadows saying his group wouldn't vote on it until Republican leaders brought a conservative immigration bill to the floor. And Democrats refused to give Ryan an assist because the bill toughened work requirements for food stamps. A late push from Trump couldn't save Ryan. Why this matters: The Republican House is careening into chaos at the moment its members most need to rally together. We're less than six months away from the midterms, and the House is on the line. Hill Republicans are anxious and effectively leaderless. Nobody fears repercussions from a lame duck Speaker. So even the usually well-behaved moderate members are wreaking havoc. "Another major misstep could really start a spiral," a senior aide to a moderate Republican House member told me. "Moderates are showing a new willingness to defy leadership, so we are tiptoeing into uncharted waters. Don't think this episode is fatal by any means, but it could be the kindling to start a bigger fire." "There's an every man for himself attitude because there's a leadership vacuum and because everyone is running scared in an election year," said a source close to leadership. When Ryan announced his retirement in April, he created a power vacuum that's being filled by conservatives, below-the-radar leadership jostling, and outside agitators like movement leader Ginni Thomas who is leading a petition for hardliner Jim Jordan to replace Ryan as Speaker. Ryan has anointed Kevin McCarthy as his successor, but McCarthy is stuck in dangerous limbo as a not-quite leader. McCarthy's enemies are beginning to peck away at him; and the Majority Leader's allies tell me they believe opponents are planting stories amping up the Ryan-McCarthy divide to "drive a wedge" between the two men. The pushback: Ryan's defenders say the Freedom Caucus's purpose in life is to screw with leadership and sink reasonable legislation. In other words: the Republican House has long been ungovernable; nothing new here. 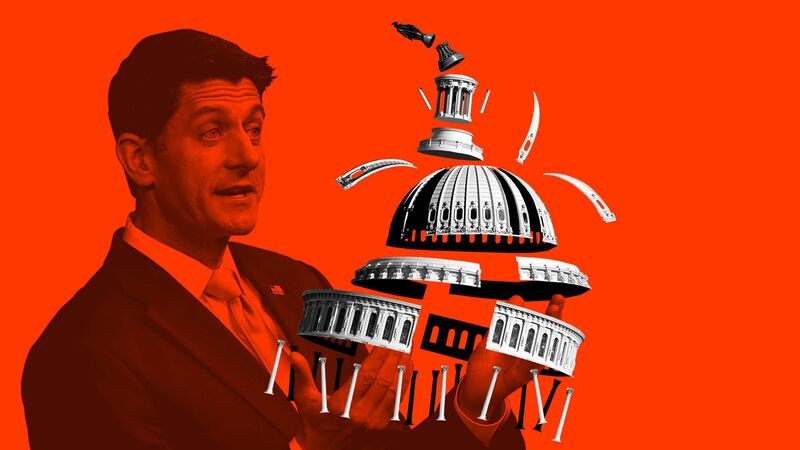 But this allegedly "ungovernable" House — led by the pre-retirement Ryan — passed an Obamacare repeal bill and overhauled the tax code. What's next: House Republicans could come to blows again in June when Ryan may introduce immigration legislation. More drama is sure when they start introducing appropriations bills and stare down a September government-funding deadline. Bottom line: None of this turmoil helps in November's elections. At 1:37 p.m. today, the President issued a consequential and ominous tweet: "I hereby demand, and will do so officially tomorrow, that the Department of Justice look into whether or not the FBI/DOJ infiltrated or surveilled the Trump Campaign for Political Purposes - and if any such demands or requests were made by people within the Obama Administration!" Why this matters: Trump was effectively rolling a grenade into the Department of Justice — ordering the agency to conduct a politically-motivated investigation of itself. Four hours after Trump's tweet, Justice Department spokeswoman Sarah Isgur Flores emailed: "The Department has asked the Inspector General to expand the ongoing review of the FISA application process to include determining whether there was any impropriety or political motivation in how the FBI conducted its counterintelligence investigation of persons suspected of involvement with the Russian agents who interfered in the 2016 presidential election. "As always, the Inspector General will consult with the appropriate U.S. Attorney if there is any evidence of potential criminal conduct." Between the lines: Trump would be happy if Jeff Sessions or his deputy Rosenstein resigned, according to multiple sources who've discussed both men with the President. But Trump's lawyers have been urging him not to meddle in the Justice Department and to avoid any actions that look like he's interfering with Robert Mueller's investigation. Some Trump allies thought his tweet would put the DoJ leadership in a bind: accept the President's order (one many will hate), or resign. A former administration official, who stays in touch with a number of people involved in these discussions, told me on Saturday that exactly this would happen. The source presented it as a perfect way to "set the predicate" for getting rid of Rosenstein. A current senior administration official then told me they'd heard this idea was being kicked around, but didn't think Trump would ultimately follow through with it. The bottom line: As I publish this newsletter I don't know whether Trump will feel mollified by Rosenstein's statement and his decision to kick the expanded investigation over to the Inspector General. If he backs off, and doesn't order Rosenstein to go even further and release documents and reveal sources, then it might be crisis averted. For today at least. He told Fox News Sunday host Chris Wallace: "We're putting the trade war on hold... we have agreed to put the tariffs on hold while we try to execute the framework." And on Saturday, after several days of talks, the U.S. and Chinese governments issued a vague joint statement, with China promising to buy an unspecified amount of U.S. products (not the $200 billion U.S. officials had been foreshadowing) and to take other wishy-washy, unspecified actions to improve the bilateral trading relationship. This was basically foreseeable. We led Sneak Peek a few weeks ago with a story headlined "the one-trick pony," in which sources who've been in the negotiating room with Trump described his predictable tactics: "threaten the outrageous, ratchet up the tension, amplify it with tweets and taunts, and then compromise on fairly conventional middle ground." And we led last week's Sneak Peek with an item headlined "Trump's grand bargain on China," in which we reported that his most bellicose threats against Beijing — which include tariffs on $150 billion worth of Chinese products — may never eventuate, as free-traders in his team, led by Treasury Secretary Steven Mnuchin, chase a deal to avoid a trade war. What's next: More talks. And miles of uncertainty between the two countries — with the added complication of the North Korea negotiations. Because it's Trump, nothing can be guaranteed. But so far, at least, Trump's bite to bark ratio on China is tracking around 85,000:1. In a speech on Monday, Secretary of State Mike Pompeo will lay out the Trump administration's new diplomatic path on Iran now that the President has withdrawn America from the nuclear deal. "Iran advanced its march across the Middle East during the JCPOA... It did so with house money, with wealth created by the West... This will not continue." A senior State Department official added: "We are welcoming ALL nations to join us in pushing back against Iran — our sanctions regime and our broader efforts welcome the participation of all countries. Certainly includes our allies in the Arab world, our European and Asian allies. Iran's threats extend globally, the response to their malign behavior should match that." Between the lines: Per the same source with knowledge of the speech, "This type of speech is in line with President Trump's goal of 'going big' with foreign policy announcements and plans." That's how the President views the North Korea talks and the Iran restart. The Europeans are skeptical about Pompeo's speech. To put it mildly. A senior European official who's been privy to the high-level conversations tells me: "If it's what I hear, it's a winding up of the spin operation; bigger better Iran deal, Europeans coming on board, but Gulfies and Asia too. We like Pompeo, and he's proving much more pragmatic than some predicted, but there is a fundamental problem here..."
The fundamental problem: The major European powers — France, Germany and the U.K. — fought hard against Trump’s plan to withdraw from the nuclear deal. And now that he has, they're trying to figure out ways to keep the deal alive and help European firms continue to do business with Iran. The Trump administration is betting that the Europeans will ultimately fold — and that a choice between doing business with Iran and the massive U.S. market is really no choice at all. To bolster that theory, we're already seeing some firms, like France's Total, cancel anticipated contracts with Iran. Most Iran experts I've spoken to are betting against a new Iran deal. They believe it's more likely that Trump follows through on his sanctions, the Europeans fold to some extent, and Iran begins making gradual steps back to developing its nuclear program. The Iranians would likely start small — for example, boosting R&D spending — because doing anything aggressive would risk war with the U.S. Hassan Rouhani is surely familiar with John Bolton's 2015 New York Times Op-Ed "To Stop Iran’s Bomb, Bomb Iran." The senior European official from the item above outlined another possible path forward to me: "There is a live and let live way through. It is that the Europeans stick with the JCPOA [the official name for the nuclear deal], the U.S. stay out but don't impose secondary sanctions on European companies, and we work together on ballistics and regional issues." Axios’ David McCabe reports that a collection of progressive groups will launch a six figure digital ad offensive Monday telling the Federal Trade Commission to break up Facebook’s social networking empire. The big picture: Facebook’s new reality is being a political punching bag for those on the left, who want it broken up, and the right, who accuse it of systemic bias. But the company continues to do well financially. Break off Instagram, WhatsApp, and Messenger into their own companies separate from Facebook proper. Make it possible for users on competing social networks to communicate with one another. Zuckerberg’s users will see them: they’re running on Facebook and Instagram, as well as Twitter and more traditional display ad slots. Groups involved range from the anti-concentration Open Markets Institute to broader progressive groups like Demand Progress and MoveOn Civic Action. Pushing back against this populist campaign, a Facebook spokesman told Axios that regulators reviewed Facebook's acquisitions and concluded they didn't harm competition. "The average person uses eight different apps to communicate and stay connected," he said, and Facebook operates only a few of those. "We support smart privacy regulation and efforts that make it easier for people to take their data to competing services," the spokesman added. "But rather than wait, we’ve simplified our privacy controls and introduced new ways for people to access and delete their data, or to take their data with them." Go deeper with McCabe's full story in the Axios stream. As improbable as it sounds, it looks like Trump is genuinely embracing an issue — prison reform — that seemed unthinkable when he was yelling "law and order" on the campaign trail. At an event at the White House on Friday, Trump endorsed prison reform — and promoted upcoming House legislation — with more passion than we've ever seen. Prison reform wasn't on his radar at all during campaign and his impulses on this issue have frequently been muddled (he wants the death penalty for drug dealers and privately has spoken admiringly of what President Rodrigo Duterte is doing in the Philippines). But this idea of a "second chance" — better rehabilitation programs and services for prisoners so they have a better chance of staying out of jail when they're released — seems to have finally connected with Trump. Jared Kushner, the prime mover of this policy within the White House, was in the front row for the event. Behind the scenes: A turning point for Trump was a Jan. 11 meeting in the White House's Roosevelt Room, according to two sources who were in the room that day. Trump was going around the room, asking everyone at the table their views on prison reform. People were talking about data and statistics, but they didn't seem to resonate. Then, according to one source, the former White House official Reed Cordish said: "Mr. President, this is important. The people you talked about on the campaign trail, that you were fighting for. The people who voted for you, the forgotten men and women who have no voice — that's who we are talking about in the prisons." "That — when he connected it to Trump's voters — really seemed to connect with him," the source added. The second source in the room confirmed that account. What's next: The House plans to vote this week on the bipartisan "FIRST STEP Act." Advocates for the bill say it will reduce recidivism rates by giving non-violent prisoners access to better rehabilitation programs, including from the private sector, and give them the "time credits" they've earned. But there’s plenty of opposition on the left — who say the bill excludes too many prisoners and reinforces racial disparities — and the right, who worry it's too lenient on criminals. Civil rights leader John Lewis is an especially powerful opponent. While it may pass the House, the path forward in the Senate is much dicier. Mitch McConnell is preoccupied with confirming judges. Law and order hardliners, including Sen. Tom Cotton, remain skeptical. Some Sessions allies have been privately referring to the "earned time credits" idea — which rewards prisoners' good behavior — as "backdoor sentencing reform." This week, the House is finally going to pass the Senate's Dodd Frank reform bill. They're also going to pass the Senate's "Right to Try" legislation — a bill that lets terminally ill patients try unapproved experimental drugs. A source familiar with the President's thinking told me he's "fired up" about this bill. Monday: Trump participates in the swearing-in ceremony of the new CIA Director Gina Haspel. He also has lunch with Mike Pence and hosts the NASCAR Cup Series Champion Martin Truex Jr. and team at the White House. Tuesday: Trump meets with South Korean President Moon Jae-in. He also gives a speech at the Susan B. Anthony List 11th Annual Campaign for Life Gala. Wednesday: Trump has a round table on immigration. Thursday: Trump presents the Medal of Honor. Friday: Trump attends the U.S. Naval Academy commencement ceremony. Our Sneak Peek item last week, "White House leakers leak about leaking," spurred quite a reaction, especially this quote from a current White House official: "To cover my tracks, I usually pay attention to other staffers' idioms and use that in my background quotes. That throws the scent off me." Several administration sources told me they thought this person sounded like a "sociopath" and surely nobody would be such a committed leaker as to do that. Turns out it's far from unprecedented. "The item about paying attention to other staffers' idioms to cover ones' tracks caught my eye. This was a tactic prevalent in the Reagan-Bush years, and there was even a Washington Post piece about the practice." A leaker had mimicked him! This is a common Washington trick. If someone wanted to sound like Budget Director Richard Darman, for example, the secret would be to use an absurdly big word, a word from the hoary depths of the dictionary, like 'inchoate.' People would read an anonymous quote in the paper with 'inchoate' in it and immediately think: That Darman! What a leaker! They all have their trademark diction, and, for Regan, 'and the like' was a dead giveaway."